The newest feature on the Hartford Hawks Women’s Basketball Blog returns for its newest installment. The Where Are They Now section will be updated every few weeks with an update from a former member of the Hartford women’s basketball team. Cedric Quackenbush, women’s basketball manager, will catch up with former Hawks and provide an update on their life after basketball. If you have a question or a possible topic for a future Where Are They Now feature, email athletics@hartford.edu. When the 2008-09 Hartford women’s basketball season came to a close, seniors Katie Kelley and MaryLynne Schaefer weren’t sure what their future would hold. Kelley and Schaefer were an enormous part of the Hawks recent success that saw them win two America East championships, two NCAA tournament games and advance to the second round of the post-season WNIT twice. Kelley was a versatile post player who peaked in her senior season and was named to the 2009 America East all-tournament team. Schaefer graduated as the school’s all-time leading three-point shooter, finishing with 222 including the game winner against Syracuse in the first round of the 2008 NCAA tournament. Now, the two former college roommates are teaming up together, again, professionally in Leimen, Germany. They are suiting up in Germany's Damen Basketball Bundesliga Sud (Germany’s second women's basketball league south) and playing for the Leimen Young Guns. The team is currently tied for first place. Kelley is currently averaging a double-double with 10 points and 10 rebounds per game, while Schaefer is averaging 11 points and five rebounds to go along with two steals per game along with a 2:1 assist to turnover ratio. After the conclusion of their senior season in Hartford, Kelley and Schaefer traveled to Germany and competed for three days in a showcase camp. Coaches and managers from across Europe attended to evaluate the prospects from all over the world. Both Schaefer and Kelley were named to a list of the camp’s Top Five Performers. After the camp, both players returned to their hometowns in the summer, Kelley in Syracuse, N.Y., and Schaefer in Centreville, Va. In October of 2009, Schaefer was offered a contract to join the Leimen Young Guns and went overseas last fall. She led the team to the championship in her first season in Germany. Meanwhile, Kelley remained in Syracuse where she joined the Onondaga Community College coaching staff and coached the team to an undefeated regular season and an appearance in the junior college Final Four. After last year Kelley got the itch to play again and the opportunity to join Schaefer in Germany presented itself. Both players described their initial transition in Germany as tough at first, but because most people spoke English it didn’t take too long to feel at home. According to Kelley, playing with a former teammate in a professional situation makes it a lot easier because we both know each other’s game and play off one another very well. Both players agree that the major difference between playing basketball in college and playing overseas is the degree of physicality. “There are times when refs will just let you play and you can almost get away with anything from a push to a constant hand check,” described Schaefer. Kelley and Schaefer also have plenty of time off of the court to enjoy the European culture. Kelley recently traveled to Prague, while Schaefer explored Paris with her parents during a recent visit. 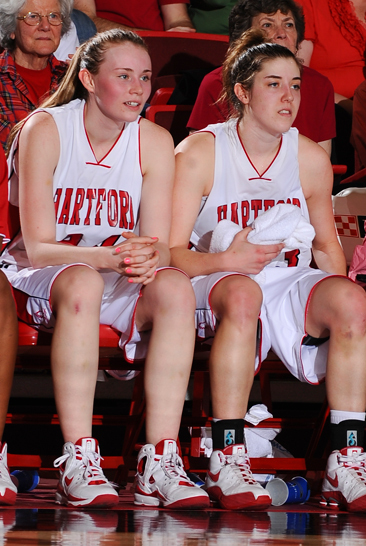 Both Kelley and Schaefer follow their former team at Hartford and have had time to reflect upon their days as a Hawk. Schaefer had the opportunity to watch this year’s squad in action at Hofstra and Coppin State when she came home for a winter break. Both miss the support from their fans including the Flight Zone, and Schaefer especially misses beating assistant coach Bill Sullivan at ‘horse’. To follow Kelley and Schaefer throughout the remainder of their season, Click Here.